either copy of the A-raised someone (unlike the case of the optional EPP in (1), where ... minimalist EPP-theory (that is, the theory of EPP-features in section 2 .... longer value T's Ï-set, the system must locate a goal in the specifier instead. new prediction: since word-order alternations involving (what appears to be) the same set of ..... The optionality of embedded clause V2-like orders seen in (3). Oct 3, 2016 - Brooklyn College of the City University of New York, .... to increasingly negative pressure, starting from P = 0.1 MPa, until it also fractures. predominant sense of a word can depend on the domain or source of a ..... within the six documents making up the Senseval-2 and -3 all-words test data. They. 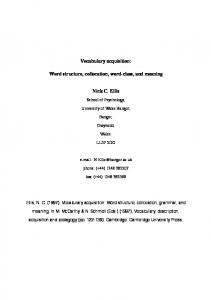 Word structure, collocation, word-class, and meaning. Nick C. Ellis. School of Psychology,. University of Wales Bangor,. Bangor,. Gwynedd,. Wales. LL57 2DG. 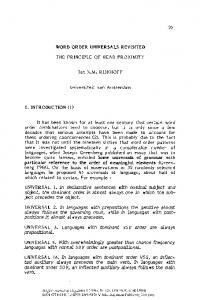 Aug 1, 2012 - between order of acquisition, segmental frequency and function: the case of ... in the ambient language on the acquisition order of word-initial. that this strong beat in children's utterances is word stress (see Archibald. 1995 ..... If children were working with feet, T. could have deleted one of the last. It has been maintained by some (Vennemann & Wilbur , Rubach , ... [w*idbr] wider), [va:ipbr] viper (cf. [w*ipbr] wiper), and [fa:il] phial (cf. [f*il] file). Email: [email protected] AbstractâIn our previous work we introduced a method for avoiding/excluding some symbols in Reed-Solomon (RS) codes,. the references therein), and Natural morphology (Dressler et al. ... theory of morphology compatible with cognitive grammar (Dressler 1990). ...... Croft, William. In this paper we would like to explore how children deal with such word order variation in the input. This study aims to answer the following questions: (1) Is the distribution of variable word order an unproblematic aspect in language acquisition or do children experience problems acquiring the various word order options? (2) Are there developmental delays in the form of non-target-like subject or object placement? And (3), are both constructions acquired more or less at the same time or is there a discrepancy between the two? Furthermore, our goal is to establish what factors may influence the acquisition process. In order to answer these questions we have investigated spontaneous child language in a corpus of three children from the age of 1;9 to 3;3. In addition we have performed a pilot elicitation experiment with four children in the age group 3;85;8. Both types of data reveal a certain delay in the acquisition of both subject and object shift, as both pronominal and full DP elements tend to occur in the nonshifted position at an early stage. More importantly, both types of data converge in showing that the object shift construction is acquired later than the subject shift construction. Several factors are considered in order to account for the children’s non-target-consistent placement of pronominal subjects and objects as well as for the delay in the acquisition of object shift as compared to subject shift. With regard to the former, a pragmatic account is rejected in favor of an explanation in terms of structural economy. Input frequency is also argued to play a role for the extended delay in object shift constructions. The paper is organized as follows. Section 2 describes the positions of subjects and objects in Norwegian in more detail. In section 3 some previous research on the acquisition of similar constructions in other languages is considered. Section 4 presents the analysis of the corpus data. Section 5 considers certain methodological issues and presents the results of the experimentation. In section 6 the results are discussed in the context of prosody, pragmatics, clitic movement, syntactic economy, and frequency effects in the input. Section 7 provides a summary and conclusion. Subject shift, in contrast, is not closely correlated to movement of the lexical verb. Subject shift across negation and adverbs occurs in non-subject-initial main clauses. Recall that Norwegian obligatorily displays V2 in main clauses, independently of whether this is ensured by an auxiliary or a lexical verb. Furthermore, subject shift across negation and adverbs is also found in embedded clauses, which generally lack verb movement in Norwegian. However, as we will not discuss embedded clauses in the current paper, we will not go further into this here. landing site (cf. e.g. Haider 2000 and Vikner 2006).2 Furthermore, as discussed above, object shift is dependent on movement of the finite main verb, and as illustrated in both (6a-b) this is not the case for scrambling. In the next section, we briefly outline some of the previous research on the acquisition of SS and OS-like phenomena, before we turn to our own investigations. One exception is the adverb der (there), which may undergo object shift in Icelandic and must do so in Danish when it is unstressed and defocussed (cf. Vikner 2006:422). In Norwegian, however, this is not the case. Ernie gaat niet die banaan opeten. (M 2;4) Ernie goes not the banana up-eat ‘Ernie is not going to eat the banana.’ Target form: Ernie gaat die banaan niet opeten. In fact, Schaeffer tried to provide both referential and non-referential contexts for indefinites in her experiments to test whether the children were sensitive to this distinction. However, it turned out that even the adults struggled to determine whether indefinites were referential or not, so in the end the results for indefinites were collapsed for both children and adults. However, the results clearly reveal that adults scramble more than children. 4 However, this conclusion seems to be problematic given that Schaeffer actually collapses referential and non-referential indefinites. darf nich Julia haben. (Mathias, stage II) may not Julia have ‘Julia may not have that.’ Target form: Das darf Julia nicht haben. den tiegt a nich wieda. (Andreas, age 2;1) that.ACC gets he not again ‘He won’t get that back.’ Target form: Den kriegt er nicht wieder. In (10a), the subject DP follows negation in the topicalized structure. Clahsen et al. (1993/94) argue that this is a consequence of the clause structure in child language being smaller than in adult language at this stage, i.e. it contains IP but not CP. Thus, the presence of a topic makes it impossible for the subject to precede negation, as there is no landing site available. Poeppel and Wexler (1993), on the other hand, claim that the target-like topicalized structure in (10b) provides evidence that the full clause structure is available to children at an early stage, as the example has both a topic and a subject preceding negation, indicating that there are two specifier positions above the VP (i.e. both IP and CP are present). As we have seen in this section, there is very little research into the acquisition of subject and object shift. The results of the one study of object shift suggest that this is a very problematic area in acquisition, and it was proposed that the construction is produced in a non-target-like manner for a prolonged period (Josefsson 1996). In Italian, children also omit or avoid object clitics, which, like pronominal objects in the Scandinavian languages, are found in a higher position in the clause. In Dutch, children younger than the age of three tend not to scramble direct objects in contexts where this is obligatory in the adult language, and it has been suggested that this is because they lack a pragmatic principle which enables them to distinguish speaker and hearer knowledge. Thus, at the outset of the current study, there are several open questions with respect to the acquisition of object and subject shift. For example, will a study of Norwegian reveal the same as the Swedish study in the sense that object shift is a problematic area in acquisition? If so, what kinds of non-target-like patterns can be observed and when do the target-like patterns emerge? Does the acquisition of object and subject shift develop at the same rate or is subject shift acquired earlier, as indicated in Josefsson (1996)? To address these questions, the next two sections will present the results from a study of the acquisition of subject and object shift by Norwegian-speaking children. The next two subsections investigate the three children’s spontaneous production of the subject and object shift constructions found in the corpus. The data on subject shift are also published in Westergaard (2008a). The children in the spontaneous corpus use two different forms of the negation, ikke and ikkje. The latter is the original regional form, while the former represents the standard and is steadily taking over for the regional form. The children in the corpus are relatively young and hence probably more likely to be influenced by the parents’ language, which is characteristed both by originating in the rural regions around Tromsø and being one generation older. In addition, the recordings for the Tromsø corpus were made between March 1997 and November 1998, and as such represents the Tromsø dialect ten years ago. This is relevant here because, as we will see in the experimental study, which was carried out at the end of 2007, the (slightly older) children in this study consistently use the standard form, ikke. Thus, we have attested a certain delay in the acquisition of subject shift in the Norwegian child data; young children have a preference for the low subject position both for full DP and pronominal subjects. However, this construction seems to fall into place around the age of 2;6-2;8 for two of the children, and only slightly later for the third child. Note that the child Ann produces three target-consistent examples in Period 4, and no unshifted ones. This child’s production is extremely target-consistent also in other parts of the grammar at an early stage (see e.g. Westergaard 2003), and it could therefore be the case that the object shift construction is in place already at this stage in her grammar. However, there are so few examples in the corpus that it is impossible to draw any firm conclusions. This means that a certain delay is also attested in the acquisition of object shift. However, unlike the situation for the subject shift construction, object shift does not seem to be in place by the end of data collection (around the age of three) – at least for two of the children. Furthermore, object shift is also extremely infrequent in the child data, as only 10 target-consistent examples are attested, compared to 124 for subject shift. This is similar to Josefsson’s (1996) findings from Swedish child language. Nevertheless, many questions remain. The dearth of relevant examples in young children’s spontaneous production therefore makes it necessary to elicit experimental data from somewhat older children in order to determine the following issues: (1) is there a real difference between subject and object shift constructions?, (2) when does the object shift construction fall into place?, and (3) are young children avoiding the object shift construction, producing full DPs instead of pronominal objects? In the next section we turn to the experimental data. 5. The experimental data In this section we examine data from two experiments conducted with four normally developing children, one boy and three girls: Are (3;8.7), Linn (4;5.21), Gry (4;6.15), and Mia (5;8.14). The children are monolingual speakers acquiring the Tromsø dialect of Norwegian. Although the data sets from the two experiments are not very large, there are some clear tendencies. Importantly, the results of the experimentation are in general consistent with the findings from the spontaneous production in the corpus: (1) Subject and object shift seem to be different in that the former is acquired somewhat earlier than the latter; (2) object shift is not fully acquired until the age of approximately five, considerably later than subject shift; and (3) the children are not trying to avoid the object shift construction. Two elicited production tasks were designed by the authors to elicit subject and object shift constructions. The tasks were carried out in one session with a break in between. In both tasks the children were shown pictures on a computer screen. In the subject shift task, the pictures were used to elicit why-questions containing a non-clause-initial subject and negation, whereas in the object shift test, the intended elicitation was transitive delcarative clauses with a pronominal object and negation. The subject shift task preceded the object shift task for all the children. Two experimenters were engaged in each task, and their roles are specified below. The tasks were carried out in one of the children’s home. The materials (colored pictures of children and objects) were obtained at Microsoft Office Online (http://office.microsoft.com/en-au/clipart/default.aspx) and modified in accordance with the purpose of each task. Before the actual experiments took place, they were piloted with two older children (aged 5;10 and 8;8), who showed targetconsistent behaviour in both tasks. The results of the pilot test thus confirmed that the experimental set-up triggered the appropriate kind of responses. test contexts. Rather they tended to substitute the proper names of the characters with pronouns. In fact, all the children produced some structures with negation and a pronominal rather than a full DP subject in this condition: Are and Linn four each, Gry and Mia two each. These responses are not included in the table, but it should be noted that they all displayed the target-consistent word order for such structures: SPRO-Neg. In addition, Are produced six other responses in this condition, one which was irrelevant and another five, which we will return to below. With regard to full DP subjects, the children show a clear overall preference for the non-shifted position. A relevant example is provided in (31). Again there was only one counter-example to the preferred order, also from Are’s production, illustrated in (32). The results of the experiment are thus consistent with the results obtained from the corpus study. The corpus data indicate that the subject shift construction is acquired between the ages of 2;6-3;0. As subject shift is unproblematic for these three-to-five-year-olds, the experimental data confirm that this construction falls into place prior to the age of three. This is arguably true even for the youngest child, Are. Although he only produces two constructions with full DP subjects, one of which exhibits the non-target-consistent word order, his five utterances containing both a pronominal and a DP subject suggest that he also prefers the low position for full DP subjects. Thus, at this stage, all the four children participating in the experiment already have knowledge about the two different subject positions: pronominal subjects are placed in front of negation and full DP subjects follow negation. As in the corpus data, the experimental results reveal that the children have a preference for the low subject position for full DPs. 5.2 Object shift: The experiment and results The second task was designed to elicit transitive declarative clauses with a pronominal object and negation. This task was presented as a ‘guessing game’. The children were introduced to an unfamiliar character called Bert Bert, and were invited to learn more about his habits. Then the experimenter presented pictures on 9 In the Tromsø dialect of Norwegian, as in most varieties of North Norwegian, person names appear with pronominal determiners, i.e. the third person pronouns ho ‘she’ and han ‘he’ (e.g. ho Nora), also called proprial articles (Anderssen 2006). the computer screen of Bert Bert together with some object, e.g. a toothbrush. The experimenter would then proceed as follows: Her ser vi en tannbørst. Kan du gjette om han treng den eller ikke? [Here we see a toothbrush. Can you guess whether he needs it or not?]. There were fifteen test contexts (three initial trial items and twelve test items) and four fillers (guessing contexts not involving negation) in this test. Initially the design was such that the child would make a guess, either responding Han treng den [He needs it] or Han treng den ikke [He doesn’t need it]. This worked well with the oldest child, Mia, who produced twelve responses containing a pronominal object and negation. However, this design turned out to be problematic when we used it with the younger child Gry. She consistently made her guesses by responding with embedded clauses, e.g. Æ trur han ikke har den [I think he doesn’t have it]. It was not clear whether this was just an individual preference or whether this response pattern was a consequence of the design. In any case, we decided to modify the experiment by introducing a second experimenter who would make the guesses. The child’s task now was to judge whether the experimenter’s answer was correct or not. In case of a wrong answer, the child was to provide the correct answer. This design was used with Linn and Are. As before, there were fifteen test contexts (three initial trial items and twelve test items) and four fillers. Upon showing and explaning the pictures to the child, the first experimenter would tell the second experimenter to make a guess: Treng han den eller ikke? [Does he need it or not?]. The second experimenter would make a guess contained in an embedded clause, in order to be able to use negation without producing object shift: Æ trur at han (ikke) treng den [I think that he (does not) need(s) it]. When the second experimenter provided an incorrect answer (which she did most of the time), the screen went blank to indicate to the child that this was wrong. The child was then told to give the correct answer, the target being Han treng den (ikke) [He (does not) need(s) it]. Whenever the correct answer was given, Bert Bert appeared on the screen performing some action. The results reported in Table 7 are from Mia, Linn, and Are, and again, the trial items are included in the table to enlarge the data set. Gry’s data had to be excluded as she only produced embedded clauses, not yielding appropriate contexts for object shift. As mentioned above, Mia produced responses containing a pronominal object and negation in twelve out of the fifteen test contexts. Of the remaining three responses, one simply contained the word Riktig [Correct] and two responses were positive answers not containing negation. Linn produced eleven responses with a pronominal object and negation. Of her remaining four contexts, one contained only the answer Ja [Yes], two were positive answers without negation, and one was an embedded clause with negation. Finally, Are produced five responses containing a pronominal object and negation. His remaining responses included four positive clauses, one clause lacking an object, one clause with the pronoun noen [someone/anyone] (see below for a comment on this), and four irrelevant responses. From the experimental data it can thus be concluded that the object shift construction remains problematic at a later stage, which is consistent with the findings from the children’s spontaneous production, where unshifted word order persisted until the end of the investigated period, i.e. the age of 3;3. The experimental results indicate that this construction does not fall into place until approximately the age of five, as two of the children aged 3;8.7 and 4;5.21 sometimes failed to shift pronominal objects. The situation is only stable for the oldest child, who was 5;8.14 at the time of the experiment. 5.3 Summary of findings The two types of data examined in this study reveal a difference between the subject and object shift constructions. The results of the experiments are consistent with the results of the spontaneous production data in that it indicates that the object shift construction is acquired later than the subject shift construction. According to the spontaneous production data, the latter falls into place around the age of three. The former is not acquired until approximately the age of five, as indicated by the experimental data. It is thus clear that the initial delay in the acquisition of both constructions observed in the corpus is more persistent with object shift. Finally, even though the children in the spontaneous corpus produced few object shift constructions, this does not appear to be the result of an avoidance strategy, because in the experimental situation, the children used pronominal objects consistently and did not tend to substitute them with full DPs. In the Tromsø dialect, the present tense of the verb å vaske (to clean) is vaske rather than vask, which is the form used in (38). This might make us wonder whether it is the final vowel of vaske or the initial vowel of ikke that is reduced, yielding vaske’ke with a clitic form of the negation. However, we feel convinced that it is the final vowel of the verb that is reduced because we see the same reduction in other places, including when the verb is followed by a word with an initial consonant, as in korfor lek(e) han ikke med ballen? [why doesn’t he play with the ball] and korfor hør(e) han ikke på musikk her på bildet da? [why isn’t he listening to music in this picture then?]. 11 In fact, the children mainly produce the full form of the negation, and only occasionally prosodify it as a clitic. When this happens, however, it seem to be in specific contexts, such as after the feminine pronoun ho yielding ho’ke [she not] or after the verb er, which is pronounced e, yielding e’ke [is not]. As a result of the former type, a clitic negation is more likely to appear when the pronoun has been shifted than when it has not. realized as full DPs or clauses. In the adult sample investigated here, the 187 subjects in subject shift contexts are realized by pronouns 94% of the time (176/187), while objects in contexts for object shift are realized by personal pronouns only 4.3% of the time (4/93). These proportions are confirmed in another study of both Norwegian and English child-directed speech (Westergaard 2008b), where it is shown that subjects in general (not only in contexts for subject shift) are realized by pronouns between six and eleven times more often than as full DPs (with some variation across samples). In comparison, objects are generally realized by DPs or clauses 3-4 times more often than as pronouns. Thus, it seems safe to conclude that input frequency plays a role with respect to the lack of frequency of object shift in the child data as well as the delay attested in target-consistent production of this construction, especially compared to the similar subject shift construction. However, note that we are not arguing that lack of frequency is the cause of the children’s delay in target-consistent production. Rather, the error pattern is originally caused by a principle of economy, as outlined earlier in this section. But as also argued in previous work, e.g. Westergaard and Bentzen (2007), we would like to claim that an error pattern that is originally caused by economy or complexity may persist for a longer time in children’s Ilanguage grammars if the relevant construction is infrequent in the input. Thus, while the subject and object shift constructions are both somewhat delayed due to economy, children’s problems with object shift is more persistent because of relatively sparse evidence for it in the input. and object shift constructions. Object shift appears to be a more problematic area in acquisition than subject shift, as the object shift construction was produced in a non-target-like manner for a prolonged period of time. Based on the results of the empirical data, we have suggested that the children do not apply an avoidance strategy here. Evidence that appears to support this proposal includes the observation that the children in this study did not tend to omit pronominal objects or substitute them with full DPs. This impression is reinforced by the fact that object shift is infrequent in the adult data as well. Instead, the delay in the acquisition of object shift compared to subject shift is attributed to the former construction being much less frequent in the input. References Anderssen, Merete. 2006. The acquisition of compositional definiteness in Norwegian. Doctoral Dissertation, University of Tromsø. Barbier, Isabella. 2000. An experimental study of scrambling and object shift in the acquisition of Dutch. In The acquisition of scrambling and cliticization, eds. Susan M. Powers and Cornelia Hamann, 41-69. Dordrecht: Kluwer Academic Publishers. Bentzen, Kristine. 2007. Subject positions and their interaction with verb movement. Ms., University of Tromsø, Norway. Bobaljik, Jonathan David. 1995. Morphosyntax: The syntax of verbal inflection. PhD dissertation, MIT. Bobaljik, Jonathan David, and Dianne Jonas. 1996. Subject positions and the roles of TP. Linguistic Inquiry 27.2: 195.236. Bobaljik, Jonathan David, and Höskuldur Thráinsson. 1998. Two heads aren’t always better than one. Syntax 1.1: 37-71. Bošković, Željko. 2004. PF merger in stylistic fronting and object shift. In Minimality effects in syntax, eds. Arthur Stepanov, Gisbert Fanselow, and Ralf Vogel, 37-71. Berlin: Mouton de Gruyter. Cardinaletti, Anna. 2004. Towards a cartography of subject positions. In The structure of CP and IP: The cartography of syntactic structures, Vol. 2, ed. Luigi Rizzi, 115–165. New York: Oxford University Press. Cinque, Guglielmo. 1999. Adverbs and functional heads: A cross-linguistic perspective. New York: Oxford University Press. Clahsen, Harald. 1990. Constraints on parameter setting. A grammatical analysis of some stages in German child language. Language Acquisition 1: 361-391. Clahsen, Harald, Martina Penke, and Teresa Parodi. 1993/94. Functional categories in early child German. Language Acquisition 3: 395-429. Clahsen, Harald, Sonja Eisenbeiss and Martina Penke. 1996. Lexical learning in early syntactic development. 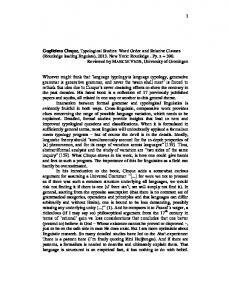 In Generative perspectives on language acquisition: Empirical findings, theoretical considerations and crosslinguistic comparison [Language Acquisition and Language Disorders 14], ed. Harald Clahsen, 129-159. Amsterdam/Philadelphia: John Benjamins. Déprez, Viviane. 1989. On the typology of syntactic positions and the nature of chains: Move A to the specifier of functional projections. PhD dissertation, MIT. Diesing, Molly. 1996. Semantic variables and object shift. In Studies in comparative Germanic syntax II, eds. Höskuldur Thráinsson, Samuel David Epstein, and Steve Peter, 6684. Dordrecht: Kluwer Academic Publishers. Guasti, Maria Teresa. 1994. Verb syntax in Italian child grammar: Finite and non-finite verbs. Language Acquisition 3: 1-40. Haider, Hubert. 2000. Scrambling: What’s the state of the art? In The Acquisition of Scrambling and Cliticization, eds. Susan M. Powers and Cornelia Hamann, 19-40. Dordrecht: Kluwer Academic Publishers. Hamann, Cornelia and Adriana Belletti. 2006. Developmental patterns in the acquisition of French clitics: Comparing monolinguals, early and adult L2ers, bilingual children, and French children with specific language impairment. Ms., University of Oldenburg and University of Siena. Holmberg, Anders. 1986. Word order and syntactic features in the Scandinavian languages and English. Doctoral Dissertation, University of Stockholm. Holmberg, Anders. 1993. Two subject positions in the IP in Mainland Scandinavian. Working Papers in Scandinavian Syntax 52: 29-41. Holmberg, Anders and Christer Platzack. 1995. The role of inflection in Scandinavian syntax. Oxford: Oxford University Press. Jayaseelan, Karattuparambil. 2001. IP-internal topic and focus phrases. Studia Linguistica 55.1: 39-75. Josefsson, Gunlög. 1996. The acquisition of object shift in Swedish child language. In Children’s Language 9, eds. Carolyn E. Johnson and John H. V. Gilbert, 153-165. Mahwah: Lawrence Erlbaum. Josefsson, Gunlög. 2001. The true nature of Holmberg’s Generalization revisited – once again. 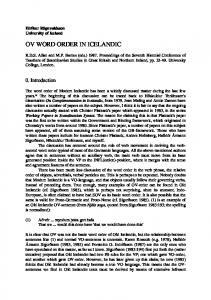 Working Papers in Scandinavian Syntax 67: 85-102. Kehoe, Margaret and Conxita Lleó. 2003. A phonological analysis of schwa in German first language acquisition. 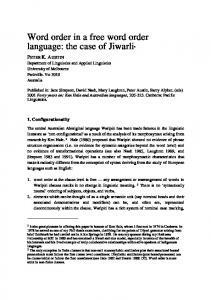 Canadian Journal of Linguistics 48: 289-327. Kiss, Katalin É. 1996. Two subject positions in English. Linguistic Review 13.2: 119-142. Lightfoot, David. 1999. The development of language: Acquisition, change and evolution. Malden, MA and Oxford: Blackwell. Lightfoot, David. 2006. How new languages emerge. Cambridge: Cambridge University Press. Mykhaylyk, Roksolana and Heejeong Ko (this volume). Optional scrambling is not random: Evidence from Ukrainian acquisition. To appear in Optionality in the input, eds. Merete Anderssen, Kristine Bentzen, and Marit Westergaard, Springer. Nilsen, Øystein. 1997. Adverbs and A-shift. Working Papers in Scandinavian Syntax 59: 131. Platzack, Christer. 1996. The Initial Hypothesis of Syntax: A minimalist perspective on language acquisition and attrition. In Generative perspectives on language acquisition: Empirical findings, theoretical considerations, crosslinguistic comparisons [Language Acquisition and Language Disorders 14], ed. Harald Clahsen, 369-414. Amsterdam/Philadelphia: John Benjamins. Poeppel, David and Kenneth Wexler. 1993. The Full Competence Hypothesis of clause structure in early German. Language 69: 1-33. Schaeffer, Jeanette. 2000. The acquisition of direct object scrambling and clitic placement: Syntax and pragmatics. Amsterdam/Philadelphia: John Benjamins. Svenonius, Peter. 2002. Subject positions and the placement of adverbials. In Subjects, expletives, and the EPP, ed. Peter Svenonius, 201-242. New York: Oxford University Press. Söderbergh, Ragnhild. 1973. Projektet Barnspråkssyntax [Project Child Language Syntax]. Department of Scandinavian Languages, Stockholm University. Vangsnes, Øystein Alexander. 2005. Microparameters for Norwegian wh-grammars. In Linguistic Variation Yearbook 5, eds. Pierre Pica, Johan Rooryck, and Jereon van Craenenbroeck, 187-226. Amsterdam and Philadelphia: John Benjamins. Vikner, Sten. 1994. Scandinavian object shift and West Germanic scrambling. In Studies on Scrambling, eds. Norbert Corver and Henk van Riemsdijk, 487-517. Berlin: Mouton de Gruyter. Vikner, Sten. 1997. The interpretation of object shift, optimality theory and minimalism. Working Papers in Scandinavian Syntax 60: 1-24. Vikner, Sten. 2006. Object Shift. In The Blackwell companion to syntax, vol III, eds. Martin Everaert and Henk van Riemsdijk, 392-436. Oxford: Blackwell. Westergaard, Marit. 2003. Word order in wh-questions in a North Norwegian dialect: Some evidence from an acquisition study. Nordic Journal of Linguistics 26.1: 81-109. Westergaard, Marit. 2005a. Optional word order in wh-questions in two Norwegian dialects: A diachronic analysis of synchronic variation. Nordic Journal of Linguistics 28.2: 269-296. Westergaard, Marit. 2005b. The development of word order in Norwegian: The interaction of input and economy principles in the acquisition of V2. Dr. philos. dissertation, University of Tromsø. Westergaard, Marit. 2008a. Verb movement and subject placement in the acquisition of word order: Pragmatics or structural economy? In First language acquisition of morphology and syntax: Perspectives across languages and learners. [Language Acquisition and Language Disorders], eds. Pedro Guijarro-Fuentes, Pilar Larranaga, and John Clibbens. Amsterdam: John Benjamins. Westergaard, Marit. 2008b. Cue-based acquisition and information structure drift in diachronic language development. Ms., University of Tromsø, Norway. Westergaard, Marit and Kristine Bentzen. 2007. The (non-) effect of input frequency on the acquisition of word order in Norwegian embedded clauses. In Frequency effects in language acquisition: Defining the limits of frequency as an explanatory concept, [Studies on Language Acquisition], eds. Insa Gülzow and Natalia Gagarina, 271-306. Berlin/New York: Mouton de Gruyter. Westergaard, Marit and Øystein Alexander Vangsnes. 2005. Wh-questions, V2, and the left periphery of three Norwegian dialect types. Journal of Comparative Germanic Syntax 8: 117-158. Wiklund, Anna-Lena, Gunnar Hrafn Hrafnbjargarson, Kristine Bentzen, and Thorbjörg Hróarsdóttir. 2007. Rethinking Scandinavian verb movement. 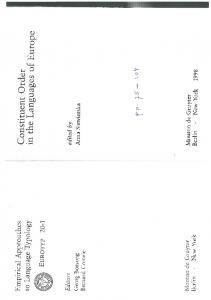 Journal of Comparative Germanic Linguistics 10.3: 203-233. 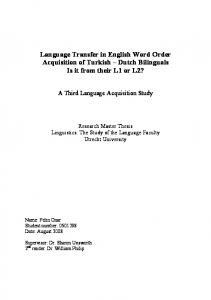 Report "The acquisition of apparent optionality: Word order"